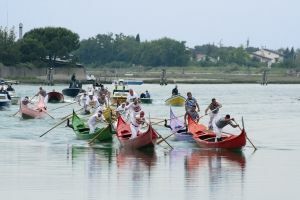 Venetian rowing is the highly unusual rowing technique that developed in the Venetian lagoon and surrounding areas, where one single oarsman equipped with one or two oars is sufficient to drive the boat forward. Its characteristic features are rowing on one's feet facing the prow, using one or two oars, the need to freely move a perfectly smooth oar with no oar button, on a special open oarlock called a "forcola"in order to facilitate the manoeuvres and steering, and the absence of a tiller. Each traditional boat has a set number of rowing positions and therefore sockets for the “forcole”(nogari or vògari). The key positions are the “pope”, who rows on the poop with the forcola on the starboard (right) side determining the direction of the boat and commanding the crew, and the "provier" who stands on the prow, with the forcola on the port side, applying force and setting the rhythm of the stroke that all the rowers must respect. Between the “pope” and “provier”, forward thrust comes from the “lai” position with the forcola on the starboard side behind the “provier”, and the “sentina” with the forcola on the port side in front of the “pope”.